It is not what you would consider an exotic fishing spot, but the Dump Bar in Richmond can be incredibly productive at times. 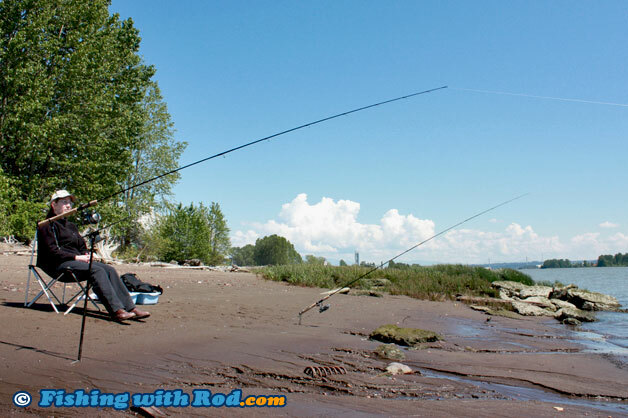 Its spacious beaches give you the option of setting up a rod holder so you can sit back and anticipate for the next bite. It is one of the few quiet refuges in a city that is developing and expanding faster than ever. Like other spots along the Tidal Fraser River, its diverse fisheries cater all types of anglers, from kids who are fascinated by sculpins to experienced rods who seek for the biggest salmon in their lifetime. To get to the Dump Bar, travel to No. 6 Road in Richmond. If you are coming from Steveston Highway, travel north bound on No. 6 Road and turn right onto Triangle Road (just north of Silvercity Riverport). Drive along Triangle Road until it connects with Williams Road. Continue until the end where the entrance of the gravel dyke is. Before entering, please note the opening and closing times of the gate. The gravel road runs along the Fraser River for up to 1km. You can park and fish along any of these spots. The last half of the gravel road provides access to several nice beaches where you can set up your rod holder. This stretch of river has had many excellent salmon fishing days between August and November. In August, Adult and jack chinook salmon that are on their way to the Lower and Mid Fraser tributaries are encountered at times. In September during odd years, pink salmon travel through in the millions and can be caught by many different techniques. In October and November, coho and chum salmon are targeted regularly. If large salmon do not fancy you, then smaller species such as bull trout, cutthroat trout, northern pikeminnow and peamouth chub are also very abundant between spring and fall. Because this stretch of the Tidal Fraser River is made of mostly gently sloped beaches, bait fishing on the bottom is the most common method used by anglers. To do so, it is important that you have a rod holder, so your fishing rod can be placed without touching the sand, mud and other debris on the beach. Secondly, bring a chair so you can sit and watch your rod comfortably. If you are fishing for small coarse fish such as northern pikeminnow and peamouth chub, then dew worms and dough balls are your best bait. If you are fishing for chinook, coho salmon, trout and char, then freshly cured roe is best. It is a good idea to save your roe for fishing in October and November, when smaller coarse fish are absent. Your rig for bait fishing is quite simple. You should have sufficient amount of weight at the end of your line so it would not be moved by the current. Tie a leader around 1 to 2 feet above the weight. You can use a three-way swivel or a T bar to connect the leader to the main line. The size of hook that you use depends on the size of the fish that you are targeting. Size 10 to 14 are used for coarse fish, while size 2/0 to 2 are used for salmon, trout and char. Beside bait fishing, lure and flyfishing can also be done. A pair of waders is beneficial as it allows you to walk past the shallow water and focus your fishing near the drop-offs. Look for structures such as eel grass patches, logs, rocks where predatory fish tend to hide. For lure fishing, choose spoons and spinners that weigh between 1/8 and 1/4oz. Chartreuse, green, pink and orange are the most productive colours. For flyfishing, large streamer patterns are required to grab fish's attention in the silty water, but sometimes smaller minnow patterns are very deadly when salmon fry are migrating downstream. You must have a valid British Columbia tidal fishing licence. Richmond is located in Fisheries and Oceans Canada's Area 29. Please read the general tidal fishing regulations and Area 29's regulations. The salmon fishing openings are usually announced during the season, so it is always best to check for opening times and other restrictions before heading out. There is often a bait ban for salmon fishing in September and part of October, so please be sure to check before you choose to use bait. Your local tackle stores will have the latest information. Please release closed fish species with care. Please respect other users, local residents and wildlife by keeping this area clean. Watch your steps! The Fraser River can be very muddy and turbulent at times.